The smallest of the nine UNESCO site is the Rio Delle Foglie (Bletterbach) an area into the Geoparc. The area covers 271 hectares and is bordered by two villages, Aldino and Redagno in South Tyrol. These two villages are located just south of Bolzano and opposite each other, from Mount Pausabella to Olcina Pass. They delimit what is the real canyon of the Rio delle Foglie. This site is a deep gorge up to 400 meters and dug into the river that bears the name of this world heritage site. The slow erosion, which has lasted for millennia, has carved the gorge, about eight kilometers long and has brought to light the long geological history of the Dolomites. In the Alps this is a unique place. Only here you can see in so little space, and depicted as if it were an open book, 250 million years written in a succession of layers of rocks. The mount Corno Bianco (Horn White), 2.317 meters high is the only major peak in this zone, the remainder of the peaks here are small. The whole area is included in Rio Delle Foglie Geological Park. In the time it was done a remarkable job to exploit this and make something unique from the standpoint of science and nature. A route has been developed with particularly interesting departure from the village of Aldino down to Redagno. In the most interesting places explanatory table were installed. From the lower Permian to Anisian, 16 tables explain clearly and comprehensively million years of our planet. You can almost touch the geological eras, such as the Permian Triassic, when a major event shook the earth, or the disappearance of many species of plants and animals. 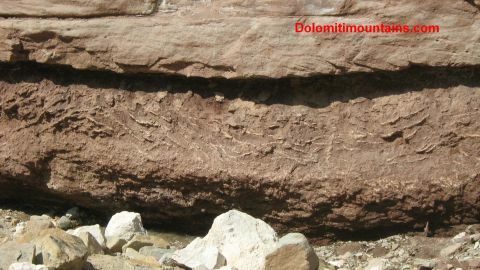 Clik here to know more about the Geology of Dolomites. 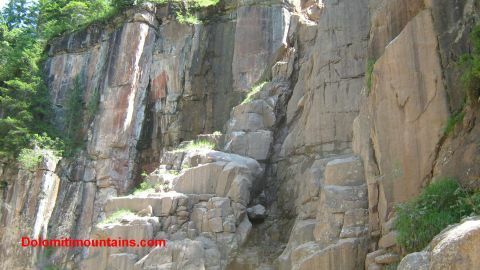 The geological ages are also represented by the colours of the various rocks outcropping in the various layers, a kind of garden colour of stone. 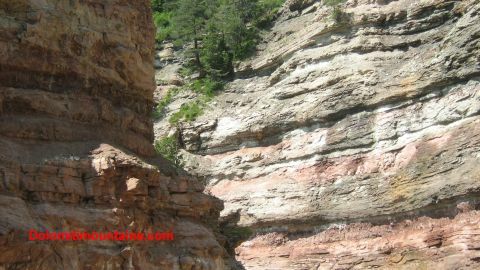 From red to very dark gray, the result of volcanic eruptions more than 250 million years ago, the reddish sandstones and conglomerates, and clays that were formed in different stages which tropical sea had in the Permian era, during his retirement. 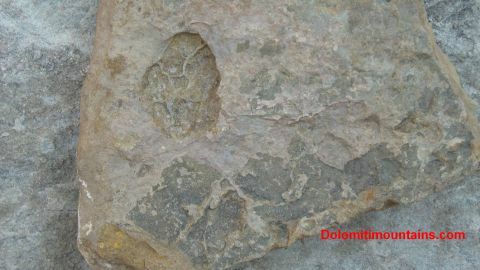 It is also an interesting place for paleontology, precisely in these layers of rock have been found numerous fossils of plants and dinosaur footprints, particularly interesting the entire cast of a small prehistoric reptile. So what is today a beautiful waterfall was formed millions of years ago by a large deposit of cephalopods. Always created by the sea a remarkable series of deposits can be seen, formed by the withdrawal and the subsequent return of water during the various eras. Erosive phases and stages of sedimentation have occurred, the minerals precipitate to the shallow water and evaporation created new layers, they was eroded again and then a new phase of sedimentation created new conglomerates. Rio delle Foglie, even if amazing for its scenery and its environment, it is very important for the witness offering about the earth's history, but only by visiting the South Tyrol, and especially this place, you know what I mean. It is not easy to reach the site, not becouse the road but the only indication for the place is four kilometers before the visitor center. From the highway A22 get the first exit to the south of Bolzano (the exit is Ora-Egna), The main road go to Val di Fiemme, turn left to the village of Aldino. At the and of the town finnaly you find the signal to the Unesco Site. For more information www.bletterbach.info Tel. +39 0471 886946 You pay 4 euro to enter and an helmet is compelled. If you have not.. no problem, they hire you one to you for 1 euro.